When parents send their children to school, they want the peace of mind knowing that the building and classrooms are cleaned to the highest standards. 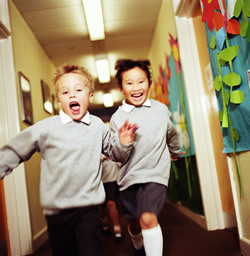 Schools are littered with bacteria and germs that can cause viruses and infections. A dirty school environment means more sick days and ultimately inhibits children from receiving a steady education. CleanSpace of Austin, we offer school janitorial services in Austin that will keep your faculty clean and your students safe. Schools and daycare facilities require antiseptic cleaning to disinfect particularly germy areas, such as desktops, doorknobs and other high-touch areas with shared surfaces. Color-coordinated microfiber cleaning cloths are extremely effective at capturing and removing bacteria and soils from these surfaces. If you run a private school, kindergarten, daycare, or pre-school, you know how important it is to keep your facilities in top shape. Clean Space will make sure that your private school facilities are attractive and inviting, while at the same time ensuring that bacteria is eliminated through our cleaning and disinfecting efforts. We understand that special attention must be paid to restrooms, water fountains, floors, and carpets when cleaning private schools. Our kids health depends on maintaining this clean environment. We build a custom school cleaning plan to fit your schedule and needs. Call or email us today to setup a consultation. Your facility can rely on our sanitation specialists for exceptional school cleaning in Austin. Our specialists employ modern methods and use high-tech equipment, fresh mop heads, and color-coded microfiber cloths to achieve the deepest clean. We clean all contaminated surfaces so that germs don’t stand a fighting chance! Each specialist wears a backpack vacuum that remove .3 microns of dirt and airborne particles that can infiltrate the lungs of students. To ensure everyone’s safety, our crew members undergo thorough background checks and wear uniforms and ID badges at every job. For more information or to schedule regular cleaning appointments, contact us today about school cleaning contracts in Austin. From preschools to colleges, we can clean them all! Children are especially susceptible to viruses in group settings where interaction is common. Studies find that a child’s immune system is not fully developed until the age of 6, making small children particularly vulnerable to catching and transmitting different strains of bacteria. Protect their health and yours with effective school janitorial services in Austin! CleanSpace of Austin will work with you to create a customized plan to produce superior school cleaning in Austin. From desks and toys to floors and cubby holes, we ensure all surfaces are sanitized in your school. Cleaning in Austin is what we do best, using eco-friendly cleaning products that are gentle yet effective. This is a system we have developed, in which we use a state-of-the-art sprayer coupled with our exclusive green disinfectant for an unbeatable clean that helps you and young ones breathe a little easier. School cleaning services in Austin are imperative to ensuring a place where youth can flourish mentally and artistically. Give students a clean home away from home, where they form bonds with their peers and create memories that last a lifetime! Call CleanSpace today to learn more about us and our school cleaning services in Austin TX. We offer complimentary estimates for clients in Austin, Round Rock, Georgetown, Pflugerville, Leander, Taylor, Del Valle, Manchaca, West Lake Hills, South Congress, Oak Hill, Manor, Jollyville, Windermere, and Bee Cave, TX.